The bonds they share with their children are intricate, fiercely protected and often tested by the vagaries of modern life. This engaging collection celebrates those relationships-lost, found, newly forged, made stronger by a boundless and relentless love. A Mother's Heart features three special women who contend with the trials and tribulations of motherhood-and find romance in unexpected ways. A single mom rediscovers a long-ago love with help from her young son and YouTube in "The Promise" by New York Times bestselling author Sharon Sala. A stressed-out executive lands on her birth mother's doorstep and falls for the guy next door in "You Belong to Me" by Isabel Sharpe. A journalist helping her adopted daughter trace her roots learns a lesson in romantic destiny in "A Daughter's Journey" by Linda Cardillo. All Three Stories Touched My Heart! This was such a heart warming anthology. 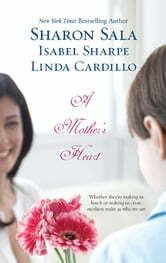 All three authors had their own Mother's Heart story to tell. Sharon Sala starts it off with "The Promise". It is heart wrenching at times but really gooey and sweet too. The kids in this book are amazing. It is a charming story of love lost and then found. The journey of Libby, Sam and Sammy is amazingly depicted. One of my favourite authors, Isabel Sharpe writes about a parent and child finding each other in "You Belong To Me." This story was so realistic since as adults we all struggle with prioritizing what is important: work, family and/or our passions. The way Maggie and Grant find each other again and their back story is so endearing. On the other hand, Clara is rather entertaining and incredibly intuitive. This story won my heart! The third story "A Daughter's Journey" by Linda Cardillo, I was hesitant to read. When I saw 1975 and that it was a two part story with each part being long, it didn't incite my interest. However, once I got started, I could not stop. The writing makes you feel like, you are right in the midst of Vietnam past and present. All the descriptions were so vivid that my imagination took off. More than the daughter's journey, it was Melanie's journey. The male character, Phil, had very small appearances but his influence was lasting. Linda Cardillo just became another one of my favourites! If you are looking for a book that is introspective, reflective, real, feel good, thought provoking and resurrects your belief in love, then this is the one for you!